Nintendo will not release any more official information on Switch titles, spec or region-lock status in 2016. 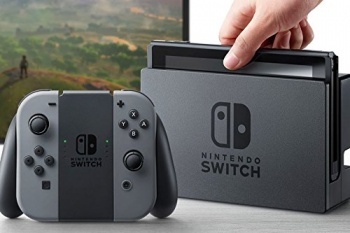 Nintendo finally revealed it's upcoming home console, the Nintendo Switch today, and while it did answer a lot of our questions, it left us with plenty of new ones. The most prominent of which are: "What games will it have, what's the internal specifications, and will it be region locked?" Unfortunately, Nintendo will not be giving us answers to these questions, at least in 2016. The Wall Street Journal's Takashi Mochizuki has stated that a Nintendo representative told him there will be "no more official announcements this year on 1) game titles 2) spec details, including region-lock status." Considering that the system is set to launch in April, 2017, that doesn't really give Nintendo a lot of time to hype it up! From the announcement trailer, we know that the system will have Skyrim: Special Edition, a new Mario platformer and some kind of NBA game, and will be backwards compatible with Wii U titles such as Splatoon and Mario Kart 8. Additionally, Nvidia have revealed that the system is powered by a custom Tegra processor.